Local, Go Karts, Track Opening Now! Milwaukee, Chicago, Gurnee, Kenosha, Low Cost, Kids, Family Fun! Cabin Fever flashbacks driving you CRAZY? Do nightmares of shoveling snow, and bitter cold temps make your heart race? Spring, has FINALLY arrived and it’s time to renew, and get on the right track. America’s Action Territories, Go-Kart Track! 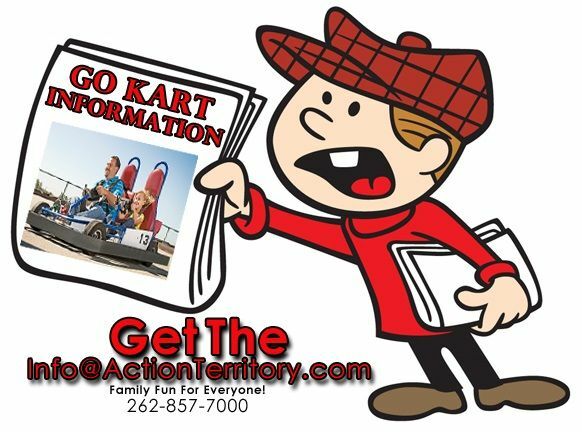 America's Action Territory Go Karts Attraction Open Now! KENOSHA, Wis. - April 12, 2014 - PRLog -- If you’re ready to race, Action Territory is ready to roll, so “Spring It On”! This 1,100 foot long, 30 foot wide track is one of the fastest rides around! The hair-pin curves and thrilling Grand Prix style racing on this amazing multi-level track is just what you need to blow back those winter blues, and blast into Spring! Outdoor Attractions are weather permitting, always log on to http://www.actionterritory.com, for current weather conditions, hours, and specials. Beginning April 30th, Action Territory will be open Wednesdays from 4pm to 9pm. The Thursday Night Indoor Special: Unlimited Laser Tag and Bumber Cars for ONLY $5. Normally priced $5.50 per game of Laser Tag, and $3 per round of Bumper Cars, it’s better than a buy one, get one, free, it’s buy one, get unlimited FREE! The April Spring Special features: Unlimited indoor wrist band with Lazer Tag and Bumper Cars, PLUS BallOcity for the younger ones, a $5 value, and The Heist, the Ultimate Lazer Maze Conquest, an additional $3.00 value, PLUS Arcade Tokens, all for ONLY $17! For a limited time only in April, a one day indoor wrist band including Unlimited Laser Tag, bumper cars, The Heist, and either 10 Arcade Tokens, OR BallOcity for kids under 54” tall, JUST $17.00! outdoor fun, go karts, amusement park, spring break, fun kids activities, theme park, indoor fun, spring breakers, easter vacation, ideas for spring break, easter events,kids attractions, family friendly, kids activities, arcade, arcade games, fun places for kids, Milwaukee area fun, fun things to do, fun things to do in Kenosha, fun things to do near me, bumper cars, mini golf, water games, bumper boats, ballOcity, batting cage, eatery, cheap deals, paintball, Kenosha area fun, things to do near Milwaukee, laser tag, pizza,Spring Break Specials, Spring Break Family Fun, April 17-27, at, America’s Action Territory, Family Fun Park, Kenosha, WI. Unlimited Indoor Wristbands, plus, Double Tokens! Unlimited Fun, and, Twice the Value, all at, Kenosha’s Spring Break Hotspot!